The Email Verification REST API is easily integrated into any application, website, or other browser-based services and ensures accuracy of all collected emails. Validate the deliverability and quality of an email address. This is the next level of validation services for our customers. 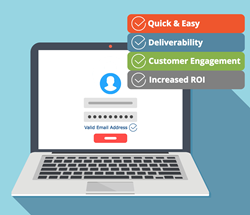 SmartSoft, Inc. the trusted address validation experts, today officially launched a new option for its current and future clients to improve the quality of their email data. The Email Verification REST API will validate the deliverability and quality of an email address in real-time at the point-of-entry. The new email validation tool can be easily integrated into an application, website, or other browser-based services such as CRM systems, to ensure the accuracy of all emails collected. SmartSoft’s Email Verification API further expands the company's range of enterprise-level data quality products and services. The Email Validation REST API is built upon a reputable backbone across multiple data centers that process millions of messages each day and provides a bridge between a company’s application or website and the email verification service, a service that validates the quality of an email address. Emails are validated in real-time, and validated emails are also assigned a ‘quality score’ and additional information on their potential deliverability provided. Quality Score – A quality score is given and used as an indicator of the quality of an email address. Several algorithms are used to determine the overall quality of an email address. Deliverability Levels – Determine if an address is deliverable or undeliverable and also see highlighted addresses that may be deliverable but potentially low quality. Disposable Email Addresses – See all flagged email addresses that were generated using services that create ‘disposable’ email addresses, designed for single use and then discarded. Free Email Address – Identify email addresses that are using free email services such as Gmail, Hotmail etc. While there is nothing wrong with someone using a free email service, certain businesses need to identify business, education, or organization email addresses or predict response rates when only sending to non-free email addresses. Role Email Address – Recognize email addresses that are typically associated with a function (support, sales, mailroom etc.) instead of a person. “Did You Mean?” Helper – An included feature that is a suggestion assistant recommending an alternative email address to use when a potentially mistyped address is identified. “This is the next level for validation services for our customers. Email communication channels are paramount to company sales, communication, and marketing strategies. Our API allows for seamless integration into webforms and cloud-based applications. It is possible to be validating emails within a day or so!” – Susan Shoffner, Business Development Manager, SmartSoft Inc.
For more information on SmartSoft’s Email Verification REST API visit http://www.smartsoftusa.com. SmartSoft provides desktop and enterprise-level workflow solutions for print management, postal address correction and postal discounts. Their products include the AccuMail® suite of data and address correction and verification software, the all-in-one mailing software solution, SmartAddresser 5™, the IM barcode mail tracking service MailSpotter, and the end-to-end print workflow solution, PressWise. SmartSoft is a privately held company. Visit http://www.smartsoftusa.com for more information.